The United States share of international students is ever increasing. Concurrent with this, other countries recognize the beneficial value of attracting students from outside their borders. In the midst of the worst immigration crisis since World War II, the U.S. presidential candidates continue to debate whether to increase or decrease their country's annual quota of work visas for educated immigrants. Many U.S. politicians put forward the argument that educated immigrants steal jobs from domestic Americans. However, the latest Open Doors report  showed that international students, and their families, supported 373,000 jobs and contributed more than $30.5 billion to the U.S. economy in 2015. Moreover, last week's USCIS data  revealed that, in comparison to last year, the number of international students in the U.S. on student visas grew from 1.11 million to 1.18 million. That's a 6.2% increase. The Chinese element of students grew by +7.9% to 353,069 while the Indian share of students grew by +31.1% to 194,438. A breakdown of the data showed a 16% increase from 413,366 to 478,851 in F & M students studying science, technology, engineering and mathematics (STEM) subjects in the U.S. Surprisingly, 40% of all F & M students in the U.S. study STEM. Yet 82% of students, from India, pursue degrees in STEM. There are more STEM students who originate from India than any other country. The latest ITIF survey  found that immigrants make up 35.5% of U.S. innovators. These are defined as people who make 'meaningful and marketable innovations' to tech-related industries. A recent extract from the influential ExecVisa publication (http://www.amazon.com/author/execvisa) stated "It is of great benefit to the U.S. if it can retain the ever-increasing number of students from many parts of the world. These immigrants have, or are in the process of attaining, suitable qualifications that are very valuable to the U.S. Their Hi-tech expertise and entrepreneurial spirit is much sought after in a country which strives to be at the forefront of innovation". A recent report  showed that the U.S. continues to be the world leader at attracting inventive talent from abroad. Between 2001 and 2010, the U.S. attracted 194,609 foreign inventors. Since 1995 foreigners have accounted for more than half of the net increase in the sector of the labour force comprised of scientists and engineers in the U.S. It is an established fact that foreign talent are more likely to be entrepreneurs and innovators; are twice as likely to start a business and apply for patents at double that of the native rate. Immigrants were involved in one in four technology start-ups in the U.S. between 1995 and 2005. Recently, WIPO reported  that Switzerland is the leader in Europe at attracting immigrant inventors. The Swiss system for innovation and business support has helped in attracting significant talent from nearby countries. Even so, with all of the countries of Europe combined, the U.S. is still the leader in attracting immigrant inventors. Registering companies and protecting intellectual property rights are more accessible to immigrants in the U.S.
An individual can apply to register a trade mark online in that individual's name - without the necessity to partner with a U.S. Citizen or own a U.S. company as is the case in some countries. Moreover, there are a wide range of business visas to choose from, and unlike other countries. Company taxes need only be filed one time per year - minimizing accountancy costs. 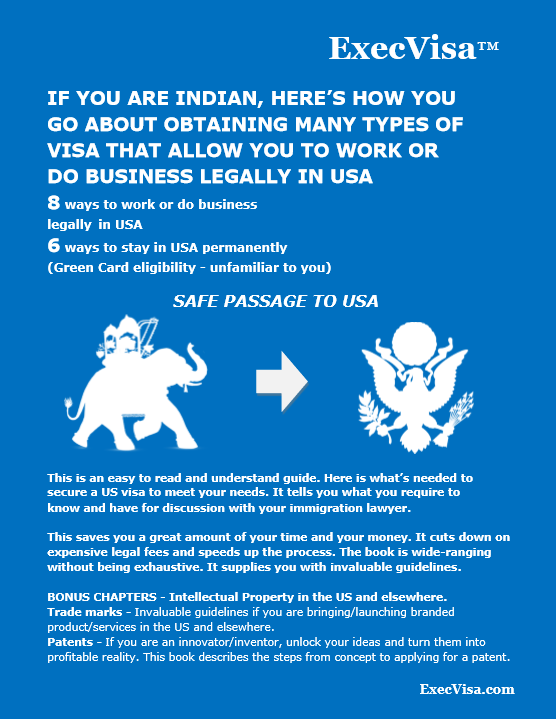 Yet another insight from the ExecVisa publication (http://www.amazon.com/author/execvisa)  provided immigrants with easy to understand and implement, invaluable guidelines relating to a range intellectual property rights in respect of the U.S. and elsewhere. The publication also provides guidelines U.S. temporary visas and the unfamiliar ways for Green Card eligibility. Latest NFAP study  found that immigrants started more than 50% of America's startup companies valued at $1 billion dollars or more and are key members of management or product development teams in over 70% of these companies. The research finds that among the billion dollar startup companies, immigrant founders created an average of approximately 760 jobs per company in the U.S. The collective value of the 44 immigrant-founded companies is $168 billion, which is close to half the value of the stock markets of Russia or Mexico. The findings help illustrate the increasing importance and contributions immigrants contribute to the U.S. economy. The ExecVisa publication  went on to state "There are many non-national students and graduates wishing to enter (or remain) in the very lucrative U.S. market place. Many see it as a country where they can hone their skills, gain first-hand experience to take back to their home country".